How recent does my prescription need to be? Do I require Distance, Intermediate or Near prescription glasses? What lens options do you offer? How long will it take to adjust to new lenses? Do you sell high index (thin) lenses? Do you sell prescription glasses with tinted lenses? What is the best lens tint colour to use? What is the best lens tint density to use? How can I find my pupillary distance? Can I measure my own pupillary distance? Why do you need my pupillary distance? Can I order frames with no prescription in them? Is it easy to order glasses online? What do I do if I make a mistake on my order? What types of lens coatings do you offer? Are you lenses quality assured? What frame style will best suit my face shape? What colour frames will best suit me? Can I pay via cheque or postal order? What if the frames I want are out of stock? I'm having trouble with the website; can I order over the phone? Can I buy glasses for my children on your website? Can I use the prescription for my contact lenses to make orders on the website? How do I know that you've received an item I returned? What if the glasses I received need adjusting? Can I return frames if I simply don't like them? It is important for you to provide us with valid prescription details to allow us to complete your order accurately. Following an eye examination, you will be able to obtain a copy of your prescription from your optician. Under the UK Opticians Act of 1989, every optician is required to provide this for your own records. We can only accept prescriptions that are no older than two years. If you don't have a more recent prescription, you will need to get your eyes re-tested by an optician before ordering. Prescriptions are generally written in the same format. You can proceed to placing your order if you have all the required information to hand by simply entering the prescription values. Leave blank any fields that are blank on your prescription. If you do not have your prescription to hand, you can give us this after ordering as soon as possible - please note your glasses will not go into production stages without a prescription being sent. Your prescription can be sent via email, fax or post. If you have a near addition or intermediate addition value this may be written in just one place on your prescription provided by your optician. However this value must be added into both eyes on our web ordering system. Please note near addition is the value needed for reading glasses and intermediate addition is the value needed for computer use glasses. If you are still having problems understanding your prescription then please contact our customer care team on help@directsight.co.uk and we can advise you. We may need to contact your optician for clarification or in the case of your prescription being in a different format. Your prescription is a recommendation for your vision given by your optician. You will need to check to see if your prescription is within our laboratory range. If your prescription is not covered by the prescription ranges on the prescription entry pages of our website please do contact us and we will endeavour to accommodate your prescription if possible. Your optician will advise you which type of glasses you require. To be able to see clearly in the distance you will need to choose the distance option, for clear reading and close work you will need to choose the near option, and for intermediate viewing (for example computer screens) you will need to choose the computer option. Prescriptions can be difficult to interpret and leave you somewhat confused when it comes to entering it online. 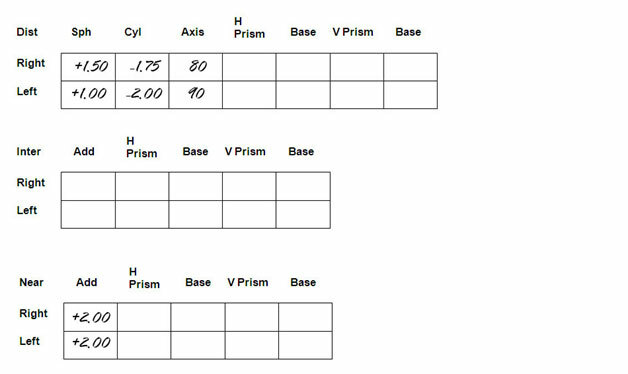 Below are some examples of common optical prescriptions from some well-known names. Follow our guidelines below to help you enter your prescription correctly. Not all prescriptions will be neat and easy to comprehend. Opticians will sometimes have their own way to write certain values, but they all mean the same thing - it's just a case of understanding it! Below are some examples of different ways your prescription may be presented. The red circled area highlights your prescription for distance glasses. Enter this into the red area circled below. The orange circled area highlights your prescription for a reading prescription. This figure should be added into the orange area circled below IF you are buying glasses for reading. The green circled area highlights you prescription for computer use. This should be entered IF you are buying glasses for computer work. The above prescription outlines three prescriptions that are needed: the optician is suggesting you need glasses for everyday wear, reading and computer work. The maximum prescription we offer is +/-8.00 SPH (sphere) and +/-4.00 CYL (cylinder). We show our recommendations where high index lenses are beneficial for specific lens powers and we will always advise you if our professional team thinks you would benefit from a high index material. Cosmetic appearance is greatly enhanced with a high index lens. 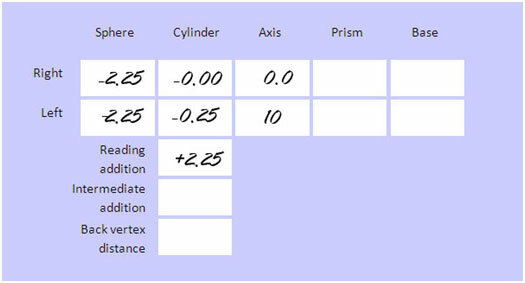 We usually consider that any prescription greater than or + 4.00 sphere often needs this type of lens (high index lens). DirectSight.co.uk offer three main lens types, single vision, bifocals and varifocal lenses. We offer a large variety of frames to accommodate varifocal and bifocal lenses and all of our frames are suitable for single vision lenses. Single vision lenses are suitable for people who want spectacles for distance only or near vision spectacles for reading only i.e. a single use. These are the lenses of choice for people not wanting or not requiring bifocals or varifocals. Bifocal lenses are required by people who want the convenience of distance and near powers, all in one lens, (i.e. two powers in one). They have a visible segment on the lenses where the two powers of the lens meet. Varifocals are similar to bifocal lenses, where the lens contains more than one power for different vision uses however there is no visible segment on the lens. If you have never worn glasses before or are having your prescription updated it is likely you will notice a difference in your vision when you wear your new glasses. This is completely normal and to be expected, the whole point of glasses it to make a difference to your sight and in most cases people adjust to this change very quickly. Even so, we would always recommend that you wear your glasses a few times and feel totally comfortable with them before embarking on any activity that could cause you or others any danger if you are not completely at ease with the vision in your glasses. Yes. Thinner lenses are made from a higher index material. They are considerably thinner than standard lenses and are often lighter than the same lenses made in conventional plastic, so they're more comfortable to wear and improve the cosmetic look considerably. Rimless frames as they provide a superior strength. Our polycarbonate lenses are unbreakable and impact resistant. In relation to standard thickness lenses 1.60 index lens is approximately 25% thinner/lighter and a 1.74 index lens. 40% thinner/lighter. Yes. We offer a wide variety of tints, available in a range many colours. Tinted lenses retain their colour and it does not fade, rub or wash off. Tints can be light or dark in colour intensity. We also offer photochromic lenses that automatically tint under sunlight and filter out harmful UV rays but are colourless when not in sunlight. Photochromic lenses therefore have the added bonus of providing two uses in one pair of glasses. At Direct Sight, we use a photochromic lens called Transitions, which you will see on our Basket page. Photochromic lenses are often not suitable for use inside cars when driving, as some windscreens absorb the UV light used to make photochromic lenses work. In this case the lenses would not darken. Photochromic lenses are great all-round lenses, offering everyday use combining a clear lens for indoor use or low light intensity situations then darkening to transform into sunglasses in high light intensity situations. They provide 100% UV protection and glare reduction is achievable because the lenses adapt to changing sunlight. Darkening in sunny conditions and lightening up with indoor use, they reduce the inconvenience of carrying around an extra pair of prescription sunglasses. Our photochromic lenses - Transitions lenses - are available for single vision, varifocal and bifocal prescriptions. According to the World Heath Authority, even on a cloudy day in the UK there is harmful UV radiation, so make sure your eyes are protected by using sunglasses or Transitions lenses. Brown and grey are the most popular tint colours, but we also offer a green tint. All tints are available in light and dark, offering you a wealth of choice. Brown is overall the most beneficial colour lens as it allows the wearer the widest light spectrum through to the eye, while blocking blue light and offering optimum contrast. Brown lenses are great for activities where distances need to be constantly judged; like tennis, golf, skiing, or other sports requiring acute visual perception and contrast differentiation. Brown is also best for lower light situations, like fishing in the late afternoon or early morning. Grey tints are most useful for bright light situations like water sports because it blocks out the brightest of the sun's rays. Other colours like green and blue are used more for fashion purposes than for utility. Yellow is used to heighten contrast without blocking too much light, and it is commonly used for shooting and skiing on cloudy days. DARK GREY reduces the maximum amount of visible light and allows for true colour recognition. It is perfect for bright sunny days and in cases where heavy glare can cause problems for your sight. In addition to general use. This tint colour is great for driving and deep water fishing. LIGHT GREY is a lighter shade of grey lens. It transmits colours evenly and allows for true colour recognition. Light grey lenses can be used as a base for creating custom colours and this colour variation is good for partially sunny and bright sunny days. DARK BROWN provides excellent contrast and improves visual acuity and depth perception. It is perfect for bright, sunny and varying light conditions. Dark Brown lenses reduce blue light and are best for driving, golfing and shallow water fishing. LIGHT BROWN is a lighter version of the colour tint which improves contrast and depth perception. It is good for partly sunny to bright sunny days and can be used as a base for creating custom colours. BLUE is used in partially cloudy to sunny conditions. This colour tint is good for tennis, golf, snowmobiling and shooting at green targets. Blue lenses let in the maximum amount of blue light. Green has slightly better contrast than the grey colours, but is not considered a high contrast lens. Green maintains true colour balance and is a good choice for varying light conditions. Green lenses are used for tennis, driving and golf as well as an all-purpose colour. Clear lenses may be tinted to create custom colours for every need or request. Only uncoated and hard coated lenses can be tinted. A Light tint - used as a fashion tint or generally for outdoor protection from the sun but not extreme light situations, such as midday sun on the water. These would be more suitable for driving conditions and can be used indoors. A Dark tint - used for sunglasses in bright light situations and provide maximum protection from the bright sun especially for those sensitive to bright light. This dark tint is not suitable for night driving or indoor vision. The most popular colour for dark tints are brown and grey. Yes. Using our state-of-the-art laboratory equipment we can read your exact prescription from your current glasses. Simply send us your glasses with our mail order form and we will be able to tell your existing prescription. This service is free and we will return your old glasses. In doing so you must certify in writing that your glasses were made to your prescription that was under 2 years old. This must be enclosed with your glasses and mail order form when they are sent to us. Please remember that it is your responsibility to ensure that your glasses reach us securely. We are not responsible for any items lost in the post. No. Contact lens prescriptions vary considerably to from glasses prescriptions. You must have a regular glasses prescription less than two years old in order to purchase glasses. Your pupillary distance (often referred to as PD), is the correct term for the distance between your eyes, measured between the centre of the pupils. This measurement is important in ensuring you get the optimal level of performance from your glasses. Your lenses need to match your PD measurement so that the centre of each lens fits with the centre of your pupils. Your pupillary distance is usually measured during an eye examination, but is not always included with your prescription. You can either ask your optician for your pupillary distance during your eye test, we can take the measurement from an existing pair of glasses, calculate the measurement for you or use the national average. If you send your own glasses into Direct Sight to have the PD measurement taken by one of our specialist technicians we will endeavour to have the glasses returned back to you as quickly as possible. Please note if you wish your PD to be taken from your existing glasses you must select the option 'Send Own Glasses for PD Check' when placing the order. There is a £5.00 non-refundable charge for this service. Can you measure my pupillary distance from my old glasses? Yes. If you send an old pair of your glasses into us one of our qualified technicians will measure the pupillary distance of your existing glasses. There is a £5.00 non-refundable charge for this service. Your frames will be returned to you after the pd has been taken. A strong prescription on a pair of glasses with an incorrect pupillary distance for the user won't cause any harm to the eyes, but may result in strain or discomfort. An accurate pupillary distance allows us to provide you with the most comfortable and suitable pair of glasses possible. Yes. Many people who do not need to wear glasses for sight correction choose to buy glasses as a fashion accessory or statement. If your eyesight is fine but you'd like some designer or fashion glasses, you can order frames with non prescription (Plano) lenses. Just select Fashion or Non Prescription on the 'Select Use' page. Yes. Ordering your glasses couldn't be easier. You will need your up-to-date prescription which can be obtained from any optician. Your prescription must have been issued within the past 2 years and if it is older than 2 years you will need to visit your optician to have your eyes retested. Once you have your prescription just follow the simple steps below. Find a frame that you like from our wide range of standard and designer frames and check to see if it's suitable for your lens type. (All frames are suitable for single vision lenses but some may not be suitable for multifocal lenses.) All of our frames will have icons to show which lens types the frames are suitable for. Select your frame colour and size. Customise your glasses by adding any additional lens options you may like. You can add thinner lenses (recommended for higher prescriptions), protective lens coatings, lens tints for prescription sunglasses or reactor light transition lenses. Enter your prescription, followed by your payment details and voila, your glasses will be on their way to you very soon. If you are unsure on how to read your prescription you may like to view our short video on the home page which will talk you through reading your prescription details. If you are still unsure you can simply fax a copy of your prescription to us on 0845 299 1565 along with a contact telephone number, or email it to us at help@directsight.co.uk, and we'll give you a call back. If you make a mistake on your order form, please contact us immediately via email or fax. We can amend any of your order details, but only up to 24 hours after the order has been placed. If you realise you have supplied the wrong prescription information or ordered the wrong frame, please tell us straight away. We process orders very quickly, and once we have glazed your glasses, they cannot be altered. If you need to get a hold of us, please visit our contact us page. We offer a selection of different coatings that can be applied to all lenses excluding tinted lenses. Coatings include Anti-scratch (Hard Coat) at a usual cost of £5.00, Anti-scratch, UV 400 protective, Anti-reflective (MAR) at a usual cost of £10.00 and sunglass tints at £5.00 (colour range available, as described above). This coat protects lenses from everyday excessive scratching that can lead to decreased vision and a reduced appearance. These coats increase durability and protection of your new spectacles. This coating helps to protect the lens surfaces from scratches, reduce distractions - such as glare and surface reflections - and protects the eye from UV rays. This Multi Coating can enhance your vision in low lighting levels and glare situations, such as driving and computing. The coating makes the lenses almost invisible by reducing the front surface reflectance, making your eyes the focus of attention and not your glasses. Furthermore, photographic and video reflection of your spectacles is reduced, as are the annoying reflections from your own eyes. The MAR coating also includes the benefit of UV 400 that helps protect the eyes from harmful damage caused by the sun. Ultraviolet radiation produced by the sun is invisible radiation that can cause damage to your eyes with long-term exposure. UV radiation can lead to numerous eye disorders including cataracts and macular degeneration; two very common visual impairment disorders. Everyone is at risk from UV damage; but people working in direct sunlight are at greatest risk. The UV 400 coating provides a great means of UV protection, helping shield against UV-A and UV-B rays. Most of our lenses are made from lightweight plastic (CR39). In our experience, plastic lenses are far more durable, much lighter and are less likely to scratch or break when accidentally dropped compared to traditional glass lenses. In all of our rimless frames we fit polycarbonate lenses; this material is unbreakable and the strongest lens material available. All orders are checked by our fully qualified laboratory technicians before dispatch and conform to all standards and impact tests. All aspects of the frame and lens manufacturer are monitored to ensure that only high quality products are dispatched to you. Our laboratories work to and our products conform to government-approved British standards. Your completed glasses will come with a cleaning cloth and will be safely packaged for delivery. Should your glasses not reach you in perfect condition we will adhere to our 100% guarantee returns policy, and refund the full cost of the spectacles to you, provided that you inform us of any defect within 7 working days of receipt. With this face shape you really can wear any frames, although do consider scale: a petite face will suit smaller frames and a larger facial structure will benefit from a more dominating frame. Go for angular frames, particularly with bold side edges. These will help to lengthen your face and add a contrast to your rounder features. Angular features can be very attractive for a masculine look, but may need softening for women. Opt for glasses with a slight oval shape to soften angular features. If you choose a squarer frame, look for one with rounded edges. Glasses that only have emphasis at the top or bottom of the frame will suit your face if you have a long face shape. If you have a triangular or heart-shaped shaped face then you will want to avoid too much emphasis across the temples. Frames with strong or heavy top edges are best avoided. A rimless frame will be a great option for you if you have this face shape. If your natural (hair, skin and eye) colouring is dark you will be able to wear darker, bolder and brighter frames more easily than fairer complexions. Black or dark brown frames in plastic or heavier metal will enhance your features, and although striking, the glasses are unlikely to dominate your face. Although dark and bolder-coloured frames may offer a style statement, they can sometimes look overwhelming on pale complexions. Rimless and delicate frames in caramels and tortoiseshell colours will complement your natural colouring. Silver, pewter or rimless frames can look complimentary with grey, silver and white hair tones. As you lose colour from your hair you also lose colour from your skin and your complexion is generally paler so ensure your glasses don't dominate your face too much. If you are looking for tinted lenses choose lighter tints otherwise they will look too heavy. Darker or more tanned complexions can get away with more dramatic coloured frames in rich bronze and gold hues. You can track your orders with Direct Sight via the 'Your Account' link. In order to track your order, you need to log into your account and select 'Track your orders'. From here you will be able find the order status for each of your purchases. If you're having trouble logging in, or can't remember your password, simply click 'Forgotten your password' to reset it. Enter the email address associated with your account and click 'continue'. You will then receive an email with a link to create a new password. If you're still having trouble logging in, contact our customer service team on help@directsight.co.uk and we'll do our best to solve the issue for you. We can accept payment for orders using a credit or debit card. We currently accept Mastercard, Solo, Switch, VISA Electron and VISA. We currently don't accept cheques or postal orders as methods of payment. We take your privacy and security seriously. All payments made via the Direct Sight website are 100% secure. We test our payment system every 24 hours to ensure our customers are safe from fraud and identity theft. We use Pay Pal to process all credit and debit card transactions for reliable, secure online payment. Your personal information is always protected by secure encryption on our website. When you enter your payment details, you can see a small lock icon on the top left-hand corner of your web browser to indicate that this is a secure page. You will see a confirmation message on your screen once your payment has been processed, as well as a confirmation via email. If you're unsure if your payment has been successful, you can contact our customer service team on help@directsight.co.uk and we'll be happy to help. If your payment is declined you will receive an error message when trying to pay. In this instance, check your card details and try making the payment again. You may need to check with your bank that there are no issues with your card or account. If you continue to have problems and want to contact a member of the Direct Sight team, please contact us on help@directsight.co.uk. We currently do not accept NHS vouchers. Your order will be reviewed and authorised by one of our fully qualified opticians, who will make sure that all the necessary information has been provided and that the frame and lens you have ordered are suitable for your prescription and individual needs. If the frame you're looking for is out of stock, you can either wait until the item is restocked, or try looking at other frames in a similar shape or style. We try to restock sold out items as regularly as possible, so it's always worth checking back if you can't find what you're looking for. If you're having any issues accessing our website or making orders, please let us know so we can help you make your order and fix any issues as soon as possible. If you wish to end your subscription to our newsletter, simply scroll down to the bottom of the last email you received and select 'click here to unsubscribe'. Unfortunately no, it's currently against the law in the UK to sell glasses online for children under 16 years of age. Unfortunately no, as prescriptions for contact lenses will differ from prescriptions for glasses, as they work in a different way. You will need a recent prescription for glasses to order prescription lenses from Direct Sight. We unfortunately do not currently offer delivery outside of the UK. Tracked Royal Mail Special Delivery Next Day at a charge of £7.95. Non-Prescription Glasses and Sunglasses - We ask to allow up to 14 working days for non prescription glasses and sunglasses to be dispatched, depending on stock availability and popular demand. However the majority of non-prescription orders will be dispatched well within this timescale. Complex Prescriptions (including Rimless glasses, prescriptions with prism values, varifocal, bifocal and polarised lens orders) - 14-28 working days. All Fast track single vision orders will be complete within 1-5 working days. Fast track rimless glasses, prescriptions with prism values, varifocal, bifocal and polarised lens orders may take up to 7 working days. You will receive a confirmation email once your item has been dispatched, and in the rare case of delays you will be notified as quickly as possible. Orders for prescription glasses may take longer to dispatch if the order contains a more complex lens combination. Delays may also occur if one of our qualified opticians needs to contact you regarding your order or prescription. In the unlikely event that you haven't received your item within two weeks of receiving a confirmation of dispatch, get in touch with us on help@directsight.co.uk and we will resolve the issue as quickly as we can. In the rare event that you receive a damaged item, please contact us on help@directsight.co.uk and we will do our best to resolve the issue as quickly as we can. In the rare event that you receive the wrong item, please contact us on help@directsight.co.uk and we will do our best to resolve the issue as quickly as we can. In the unfortunate event that the frame you order becomes out of stock we will inform you of the expected delivery date along with suggesting similar frames in case you are interested in exchanging to an alternative item. If you wish to cancel the order we will have a refund raised for you immediately. The arrival of the money back into your account will depend entirely on your bank's clearing times. We ask you to allow 7-14 working days for clearance into your bank. We try to restock sold out items as regularly as possible, so it is always worth checking back if you can't initially find what you are looking for. We are proud of our service and our team of skilled opticians is dedicated to ensuring your glasses are manufactured to your exact specifications. We make every reasonable effort to ensure that you are satisfied with your purchase and that the correct prescription, lenses and frames are always sent out. However, we realise that problems may occasionally occur. We will then send you an email to confirm when we have received your item(s). Please note, it can take up to 48 hours for returned items to filter through to the correct department. If you have any questions about returning an item, feel free to contact us on help@directsight.co.uk and a member of our team will be happy to help. Unfortunately, we cannot accept liability for any packages lost in the post. If returning item(s), we recommend you send it via recorded delivery and obtain suitable proof of postage. This allows us to track the parcel if there is a delay in receiving it. If it is confirmed that we are at fault, we will happily refund the cost of postage if you provide a valid postage receipt. Your refunds and returns statutory rights remain unaffected. a) If returning items, the product(s) need to reach us within 30 days of the item being dispatched by Direct Sight. b) If you find a problem with your order, you will need to inform us within 7 days of the date of dispatch. c) All items must be in their original condition. d) All items must contain their original accessories, such as case, cloth, etc. e) All items being returned must be sent along with a completed Returns Form which can be found on the back of your invoice. To minimise delays on your return, please complete the enclosed Returns Form to help us understand exactly why you are unsatisfied with the item. This allows us to process your return as quickly as possible. Please be careful to provide correct, valid prescription details because we cannot refund the cost of lenses made to match an incorrect prescription you have provided. We will also not accept returns if you were advised that the product was unsuitable by a member of our team (or via information provided on the website) before or during your purchase. Direct Sight will let you know via email once a returned item has arrived back with us. Please note it will take a few days for returns to reach us and be processed. If you need your frames adjusting, you can contact us on help@directsight.co.uk. Alternatively, you can take your glasses to a local optician, although they may charge a small fee to make the necessary adjustments. Similarly, if you find a screw has fallen out of your frames at any point, you can return the frames to us and we will fix them for free, or you can take them to a local optician practice. We will accept returns for products that you don't like, as long as the conditions set out in the Direct Sight returns policy are met. Finding the right style of glasses isn't the only thing you need to consider when buying new spectacles online. 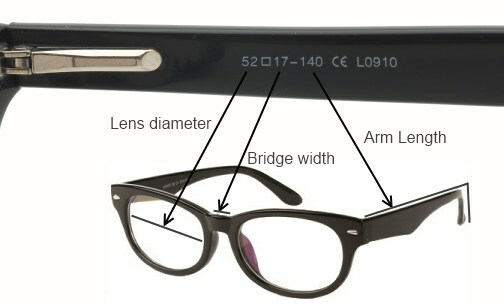 Firstly, consider the lens diameter which is the width of the glasses lens (measured in mm). This will be dependent on your preference for how you want your glasses to look; bear in mind smaller faces may be fine with smaller lens diameters whereas larger faces may need a larger lens depth in order to see more comfortably out of the lenses. The bridge width (the gap above your nose between the lenses) will be dependent on how large your facial profile is. If you have a larger nose and wider face, go for a bridge width of above 20mm. Considering arm length is also important. Once again, larger faces may feel more comfortable with an arm length of above 140mm. Lens depth is an important consideration for complex lenses such as a varifocals and bifocals A larger frame will allow for a wider field of vision and allow your complex lens to be fitted properly and allow both the reading and distance prescription to fit in comfortably. Finally, the frame width is important to consider for larger faces. If you have a large face you may want to opt for a larger frame to allow for a comfortable pair of spectacles. Sunglass tints are also important to consider, as glasses frames with limited width won't allow for much shelter from the sun's rays. Look at our measurement guide below for guidance on where to find these measurements. If you have a pair of glasses you find particularly comfortable, choose a pair of new glasses with these measurements in order to ensure your new glasses are as comfortable as your old ones. Measurements on the arm of your spectacles are listed in order of lens diameter, bridge width and arm length and will look something along the lines of 52  17 140. Remember, everything is measured in millimeters (mm).